A word. An iota of info. The news, be it good, bad, or ugly. That grimy scrap of a rumour wrapped in a cruel whisper to lay at withered ears. Those hours spent in faint hope mixed with dread that the unforeseen worst might be true… Whatever it is that the friends, family and others have waited for – for so long – they’re still waiting. Still, there are no answers for the loved ones of an estimated 60,000 ‘disappeared’ in Sri Lanka’s bitter, protracted, and apparently ongoing conflict with itself. Now, at last, at least, there is relief. If not exactly the blessed release of knowing with a dead cert finality, there is the catharsis of open protest at the lack of progress made. And – wonder of South Asia, small miracle – there is no pushback from the powers that be. It is a consummation devoutly wished for decades. But the time may not yet be fully ripe to consummate a harvest of righteousness in our blessed isle. 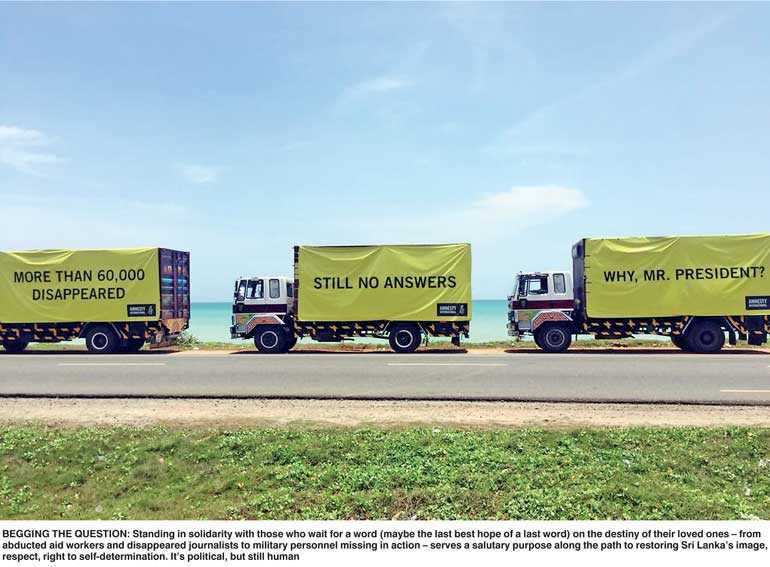 Since the Government’s laissez-faire response – or lack of one – to Amnesty International’s street campaign this week comes with the flip side of laissez passer. However benign the incumbent administration may seem to be, Sri Lankan and global watchdogs must remind themselves as much as the authorities that demonstrations being suffered in silence with patience (‘this too shall pass’) is not necessarily a good thing. Therefore, watchful vigilance must not abate. The balmiest weather can go bad in two shakes of a Goat’s tail. We are not done – quite. But first, credit where credit is due. There were many polls trail promises made by the powers now in while they were out in the cold. Here is a (one might essay rare) singular instance in which the erstwhile opposition now entrenched in a political establishment has walked the talked. It has delivered the goods in respect of a just and peaceful milieu in which citizen rights to dissent are showcased in caucus and constitution as much as in openly angry demonstration. Or at the very least it has let it come to pass that Sri Lanka’s undertakings to the international community and its nod to being readmitted to the human race after a debilitating humanitarian crisis, which left our reputation in tatters, is not seen as some savvy insincere diplomatic game. And if peace without justice is the present impasse to which we have come by default if not design, let that too pass. That what has come to pass in the present can be a hedge against tomorrow’s outrages must not escape our attention. For civil society joining hands with global bodies – albeit tarred by the brushes of other lobbies – can work to build bridges from Sri Lanka’s scarred past to a blemish-free future. If only political will rather than political oh-let-it-pass prevails. Don’t forget: governments under pressure in extremis from insurgents and insurrectionists can be excessively violent – and even cruel – in systematising enforced disappearances. It has happened not once or twice, and will again – if we don’t act judiciously now to criminalise abduction, torture, execution. And so then to the devil his due. But to find the res, one must dig a little deeper as always. For the sins of the previous regime – and other non-salutary administrations before that incarnation of banana republicanism – can’t pale to those who still wait. That by then no means shadowy figures in our myriad abductions and assassinations continue to be at large – and strut and fret their petty (coming?) hour on the national stage – must give us pause. There are a few who stand culpable for the deaths and disappearances of the many… some say as much as 100,000 in Sri Lanka alone in over three decades of civic conflict and attendant chaos. Were they unmitigatedly guilty as once alleged, ad nauseam? Are they untouchable now, for reasons yet to be disclosed by those who hold law and order highly yet lightly at present? Where will the fully anticipated operationalisation of the Office of Missing Persons and a movement to restore not only democracy but the dead to their dear ones leave the villains who made a desert and called it peace? Is Government’s splendid benevolence paving the way for playing the Goat? And we don’t mean to be disrespectful to the democrats who are really trying, but how hard is it to collar the remnants of a criminal cabal now that we’re ostensibly under the rule of men entirely great? Or must men and women who went to the grave believing that the rigorous pen is mightier than the sword of realpolitik remain dead – or missing for ever? Is it prudence (“we must be cautious – polities are perverse about their heroes”) or pragmatism (“we must carefully consider our own future – elections are eventually won by personalities not principles”) that prevents the powers that be from going the whole hog, or the Whole Goat? But a journey of a thousand miles begins with but a step. Baby-steps have been taken towards national reconciliation. There are miles to go before we sleep. However hard the interim may seem to be, those who are sincerely committed to transitional justice as Sri Lanka’s last best hope before the light fades must stay the course. Rejoice with those who savour liberty. Grieve with those who yearn for closure. Mourn for those who have no body to bury or the ashes of a loved one’s destiny to inter. Therefore this week we stand with those who wait with bowed heads but uplifted eyes. Because this is the only way that we can serve the dearly beloved missing or not quite dead. I suspect that even if it is a dying political right to shout out aloud that there are still no answers, it is equally a human need to be allowed to ask the lively questions that make even all the political animals human.